Close to Ceiling Lights come in many finishes and designs, from basic (and copied) designs to close mount crystal lights. We have hundreds of different models to choose from, so follow our guide to help narrow your choices down to a more manageable selection. If the location on the ceiling isn't wired for a lighting fixture and you are unwilling to hire an electrician, you might want to consider a floor lamp. If you have a low ceiling and want to light a room and move air at the same time, go with hugger ceiling fans with lights. For the most visually artistic and complex lighting setups, use track lighting. For focused light instead of general purpose lighting, try recessed lighting fixtures. For a large room with higher ceilings, a chandelier light may be a better choice. Now that you have decided to go with close to the ceiling lighting, you have to figure out if you need flush or semi flush mounted fixtures. For low ceilings (below 8'), stick to flush mount lighting. They are installed flush, right up against the ceiling, so taller people won't walk into the fixture. Kids rooms are a great place for flush mount lighting because when kids jump up and down, they will not hit the flush light fixture. For slightly higher ceilings (between 8' and 10'), semi flush lighting is an option. These semi flush ceiling lights generally hang less than a foot away from the ceiling. The semi flush mount light will still give good enough clearance for taller people. For over 10' ceilings, you might want to graduate to chandeliers or pendants. Their hanging height can vary wildly. 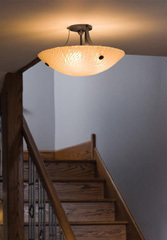 A flush light fixture is a good idea for a hallway, closet, or a bathroom. 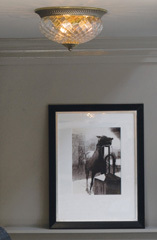 A semi-flush light fixture is a good idea for a kitchen or a smaller low-ceiling dining room. If you are looking to buy other fixtures for the room (such as vanities), try to purchase all the fixtures from one collection for a unified look. 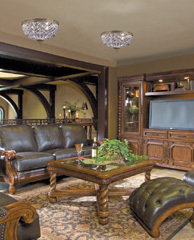 Flush Mount Crystal lights are usually for more formal themed rooms. Many classic styled homes use flush mount crystal lights to dress an elegant dining room. Some styled fixtures (like floral, nautical, or rustic) may not be for everyone, they have a specific target audience and intended room type. Energy Star close mount lights can help lower your utility bill.